For the past 10 years, DiGiCo has been hosting onsite training at its UK head office, as well as with various distributors and a number of locations around the world. This has worked extremely well, but DiGiCo is keen to ensure that those users and potential users who find it difficult to access this resource are still able to benefit from its content. DiGiCo Online Training, the first tutorial of its kind for the pro audio industry, is set to address this need. A large percentage of the SD user interface is common to all products, so it was logical that the SD9 should be used as the subject for this comprehensive tutorial, it being the first in the SD series of consoles that comes with a remote rack as standard. The tutorial is split into three sections: a quick start for those who have never used, or seen, a DiGICo console before; standard tuition that shows all major setup, functions, controls and parameters; and an advanced section for those wanting to learn enhanced features such as remote control, mirroring consoles and programming for complex shows and systems. There is a little less than three hours worth of material, which is divided into the three sections described above, and then further broken down into chapters specific to features and functions users may wish to gain greater knowledge of. All movies are HD so they can be shown at full screen size. 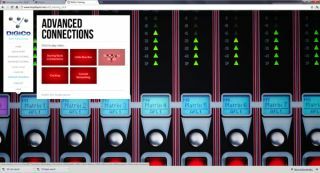 DiGiCo Online Training will be live and online from March 21st 2012, the first day of ProLight+Sound. To access the training, visit www.digico.tv and following the navigation panes for the particular tutorial you wish to view.